January 24, 2016. Winter has been a bit of a bust by Norwegian standards — surprisingly warm with little snow, at least around Oslo. All the prognosticators have been shamed. Every weather report, and every Norwegian on-the-street, had predicted that 2016 would be the worst winter in decades. “Snowfall measured in meters, and temperatures cold enough to freeze the fish in midstream,” most said with a shudder and a grin. 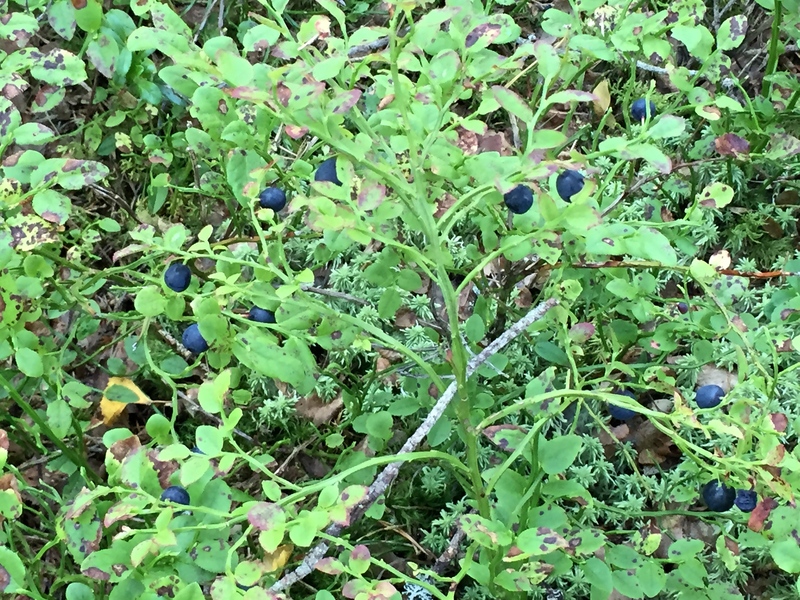 Apparently, the bounty of blueberry picking we enjoyed this summer was due to the forthcoming bad winter. 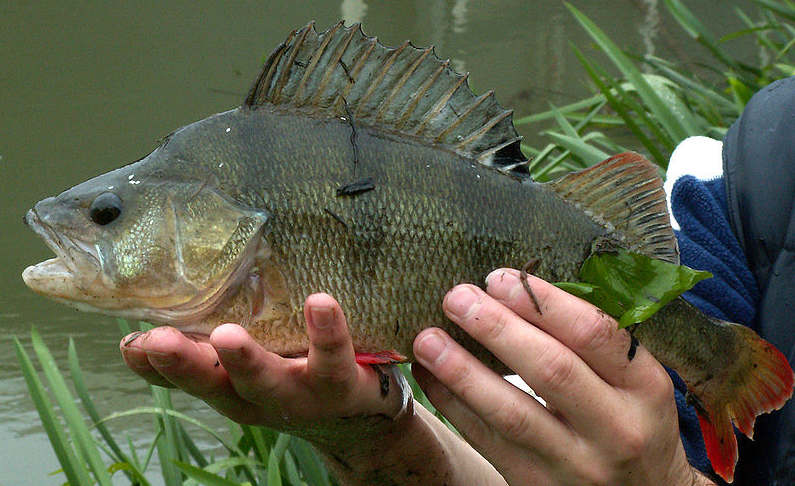 Note the 12 membraneous sections on the big dorsal fin of this perch from Belgian waters. Applying Frang’s theory, it looks like January and February will be mild in Belgium, but December could be rough. Photo: Wikipedia Commons, Piet Spaans. Frang’s theory is based on the dorsal fin of a perch, which conveniently has 12 sections, one for each month in the year. Light-colored sections mean mild weather. Dark ones mean bad weather. And this year’s sections representing January and February? “Black as night — it could be a very rough season,” he said. Hmm. To be fair, maybe the fish in Frang’s stream have had it rougher than the rest of us. 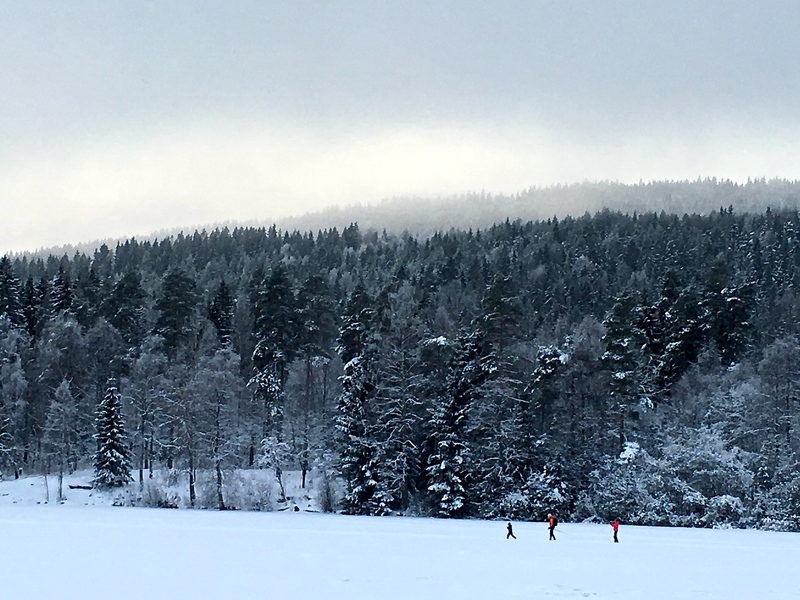 A few skiers cross the frozen surface of Sognsvann Lake. But here in Oslo, things have been relatively balmy. The days have passed with a paltry few inches or mere dusting of snow, resulting in lots of long faces on the streets. 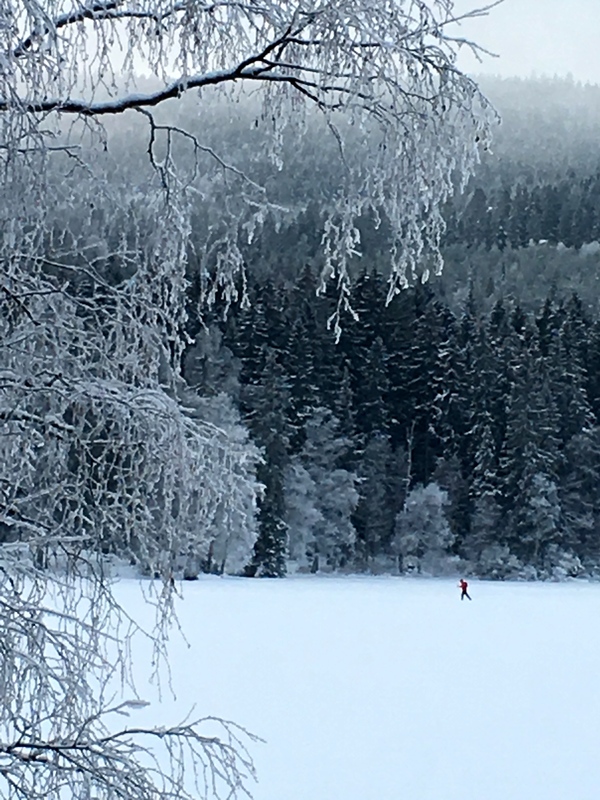 So when we finally did get a respectable showing of the white stuff one Sunday in late January, Matthew and I ventured up the mountain to Sognsvann Lake to see whether skiing would even be an option. Normally, the lake would be covered with folks skating, skiing, picnicking, and playing on the ice. I don’t know if it was the bitter wind, or the fact that the snow was unsatisfactorily sticky, but few people were out. We had the place almost to ourselves, a rare occurrence for a popular trail usually packed with strollers, skiers, sledders, and snowshoers. Perhaps the Norwegians had given up and gone to resorts further inland for the weekend. 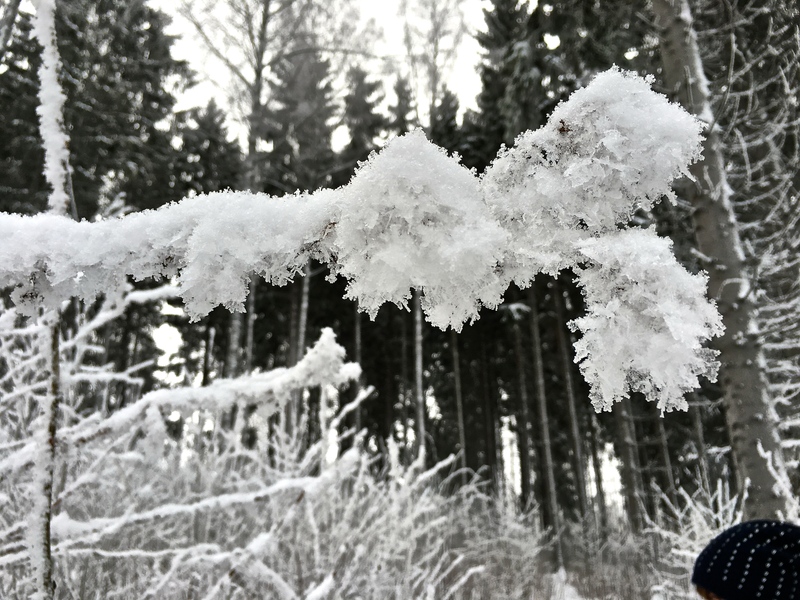 Click on the photo to get a good look at the size of the snowflakes and ice crystals that make up this clump. I think it looks a bit like a bearded troll, or maybe a snowy owl in flight. Matthew and I decided to make the most of our solitude and spent at least two hours toddling along the lakeshore taking photos. Glittering crystals coated every branch and clung together like acrobats, constructing improbable formations that defied gravity. Snow carpeted the flanks of trees, wrapping them in wooly camouflage patterns. A thick crusting of frost gave everything the silvery, blurred appearance of an early tintype photo. I love how the snow reduces everything to basic black and white, so it’s all about the texture. A tangle of tree limbs creates a Rorschach inkblot test. The snow provides a disguise for a BIrch tree, giving it the patchy, grey-camo bark of a Sycamore. Check out how frost turns a lakeside barn into an old-timey tintype photo. One of several photogenic brooks that fill the lake. We felt almost woozy from the metallic ozone smell of ice. The ear-throbbing silence that announces a fresh snowfall and heavy-laden skies seemed deafening. It drowned out the rude crunch of our feet in the snow and the timid babble of a nearby brook as it threaded its way to the lake. 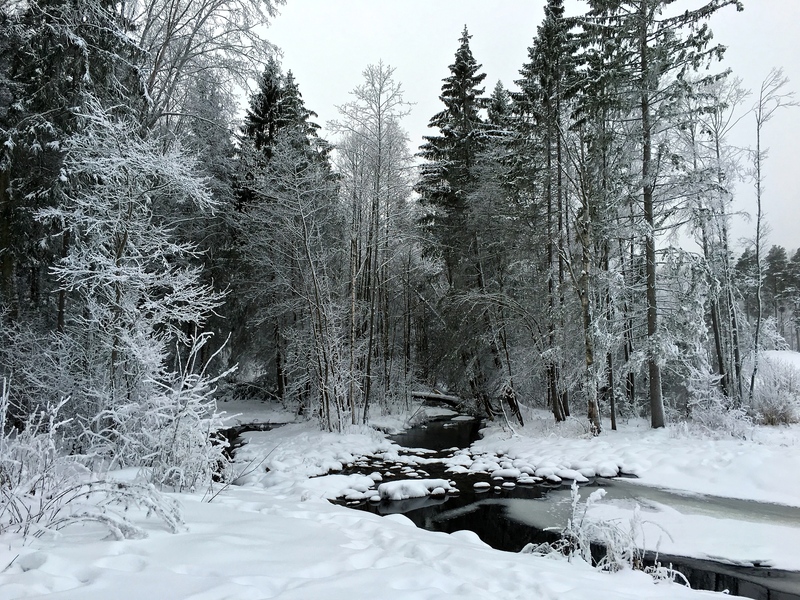 I can definitely see why Disney’s “Frozen” took its inspiration from Norwegian winter landscapes and fairytales. After following the pathway for a bit, we wandered off-trail and into the woods, where a dense congregation of conifers offered a surprisingly toasty shelter. It was at least five degrees warmer in their midst — I swear heat radiated from them. I’m not sure I’ve ever been more aware that a tree is a living, breathing being. 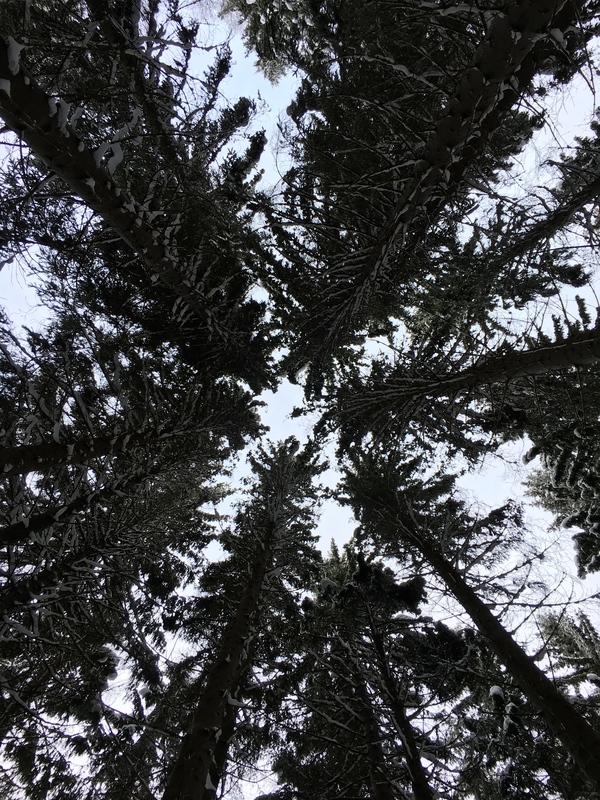 I laid down in the snow to stare up at the sky, and imagined that the pines overhead were having a treetop discussion. It reminded me of being a little kid at Christmas time, falling asleep on the living room floor while parents and grandparents conducted conversations far above me, both literally and figuratively. 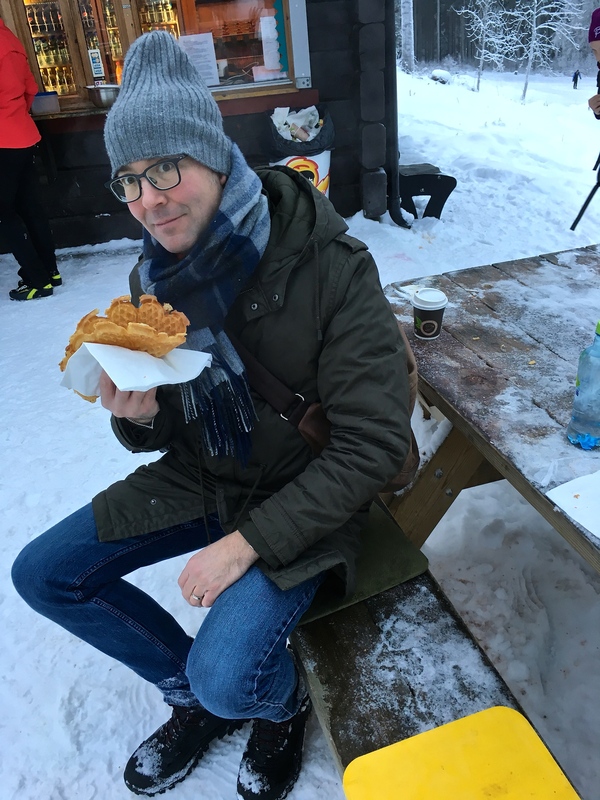 Eventually, the chill penetrated our snow gear, and we headed back to the trailhead where the ski hut offered us hot coffee, pølser (hotdogs), and Norwegian waffles with brunost (brown cheese) and strawberry jam. Nothing like carbo-loading on a cold day. The trip home aboard the T-bane (Metro train) showed us that more folks than we’d realized had attempted cross-country skiing, so we made up our minds to take the skis out for a spin after the next snowfall … which didn’t come for another several weeks. The Sognsvann ski hut offers everything you need to refuel after playing in the snow. This skier stops to take a call while acting like a sled dog for his kids in the carrier behind him. A surprisingly crowded train testifies to the number of folks who went further up the mountain to ski.